"For those who have followed the career of Kalevi Aho (for instance through the more than 20 discs of his music released on BIS), it will be clear that he enjoys large-scale projects. One such project has been his 'oboe project', composing works in every genre for the instrument. These plans can be said to have begun soon after the Sonata for Oboe and Piano included here, composed in 1984?85 and thus possibly the first such work for this combination by a Finnish composer. 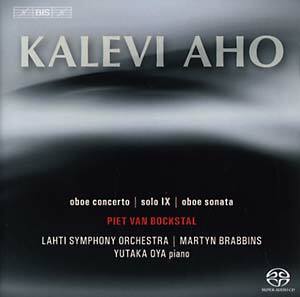 The project received fresh impetus in 2002, when Aho encountered the eminent Belgian oboist Piet Van Bockstal. As a result he composed his Oboe Concerto, premièred by Bockstal in 2008, a work in which Aho wanted to explore fresh directions for tonality as well as creating orchestral music with a more powerful rhythmic pulse and a richer sound-world. As a result the Concerto employs scales from Arabic classical music as a melodic basis in some of its five movements, and also features the Arabic darabuka and African djembe (two types of goblet drum)." Featured works: Concerto for Oboe and Orchestra (2007); Solo IX for Oboe (2010); Sonata for Oboe and Piano (1984-85). Performed by: Piet Van Bockstal, oboe. Lahti Symphony Orchestra, Martyn Brabbins, Yutaka Oya, piano. Stereo/multichannel hybrid SACD that can be played on any CD player.